When you get hacked, it’s not like alarms go off with flashing lights and a PA announcement that we’ve gone to DEFCON 2. (Although, now that we think of it, that would be pretty great, because at least then you’d know you have a problem.) However, when your computer gets hacked, you usually have no idea. And if you don’t know you have a problem, you don’t know what kind of data your hackers are stealing, how long they’ve been stealing it or how many other computers you are infecting. So how do you know if you’ve been hacked? Perhaps you’ve gotten a ransom note or, though less common nowadays, you get a fake antivirus message stating, “Warning! Malicious software has been found on your computer! 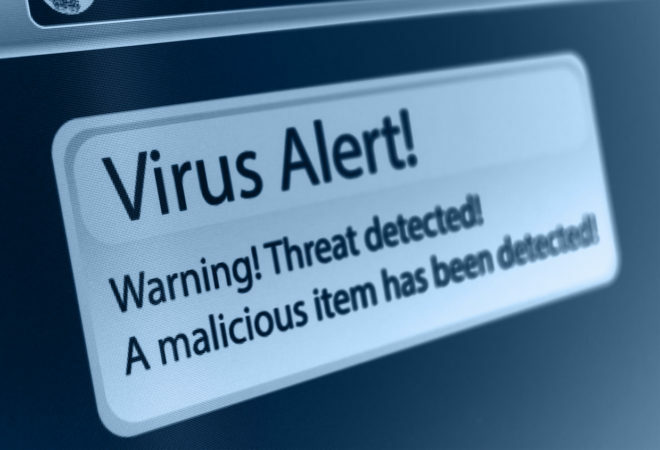 Download our antivirus software now!” By the time you get a message, it’s too late and your computer has been compromised. If you have a recent back up, restore your computer to that time. Suddenly your web browser has new toolbars you didn’t knowingly install. This is a sign you’ve been compromised, though not always. Sometimes, when installing new software, you are asked if you want to also include a new toolbar. Many users don’t pay close attention during the installation process. Hackers sometimes redirect your browser to sites that are unrelated to where you want to go. A good way to test for this is to type in words you don’t normally use, such as “bubbles” or “convertible” and see what appears. Are you getting random popups from sites that don’t normally generate them? Chances are you’ve been hacked. Maybe you’re trying to log into your credit card or bank account and suddenly your password isn’t working. It could be that you’ve been hacked. You may have inadvertently responded to a phishing scam and a hacker has compromised your info. First thing to do is to alert your friends and family to warn them this is happening so they can be on their guard. Then contact the site in question and tell them you’ve been hacked. If the same login info is used on other sites, change those usernames and passwords to contain the hack. Remember: websites don’t usually send you emails asking you to provide your information, so avoid clicking on any of those. When in doubt, call the company in question. You’ve probably seen this one. You get an invite to become friends with someone on Facebook with whom you are already friends. (Or they get one from you.) What’s happened is a hacker either controls your social media page (or has created a second near-look-alike bogus page) or you have accidentally installed a rogue social media application. Usually the hacked person is the last to know. The best thing you can do is to warn your friends to not accept new invites from the hacked person, then contact the social media site to let them know the request is coming from a bogus account. Or maybe you see your mouse moving on its own. That means there’s a hacker manipulating your computer and it’s only a matter of time before they try to log on to your bank and steal your money. If you catch them in action, wait a second before turning your computer off to see what they’re after. If you have time—you don’t want them to actually steal anything—take pictures with your phone to document the attack. Then turn off your wireless or turn off your computer. Use another computer to change all your online passwords. Check your bank history, etc. If you’ve lost any money, call law enforcement and be sure to leave your computer alone so a forensics team can copy it. Hackers have made a purchase in your name and had it shipped to some place other than your house. This is rough because it may be hard for you to understand how they hacked you. If you can figure it out, follow the above recommendations. In the end, you will have to change all of your login information for all of your accounts, and you will have to begin the tiresome process of clearing your name and your credit. This will take months, but you should be able to undo most of the damage. These are the main signs you’ve been hacked. In the meantime, make sure you have good antimalware software up and running on your machine (and that it’s up to date). Also be sure to constantly back up your computer, so if you need to restore your machine you can do so without major loss of data. For more information on cybersecurity, contact Vanguard Resources.